One Reason Is Related To Why You See Lightening Before You Hear Thunder! The reason over half the shielding gas used is wasted, even with proper flow settings and no leaks, is excess gas is stored in the gas delivery hose every time welding stops. That excess gas "blasts out" of the MIG gun nozzle (or TIG cup) at every weld start! Excess gas is stored because the minimum pressure upstream of the flow control needle valve in a flowmeter or orifice in a cylinder regulator/flowgauge must be greater than 25 psi. The following explains the reason for that pressure and the "gas blast" at each weld start and how it relates to "hearing thunder:"
The Engineers Designing Flow Controls Knew Flow Restrictions Must Be Compensated! 4) the MIG gun cable gas hose performs a double function of holding the spiral wire liner and can clog with; a) wire drawing compound, b) shop dust and c) copper flakes from a steel wire coating. 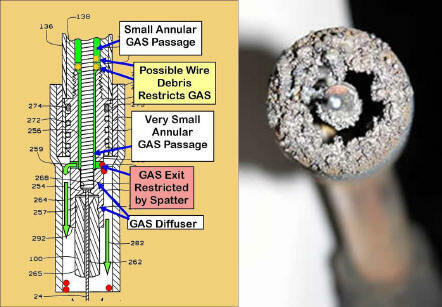 This debris accumulation not only causes wire feeding problems, it also creates gas flow restrictions. To keep flow rate at the preset level with these changing restrictions is a challenge. Fortunately the engineers that designed the gas flow controls when MIG was introduced were "smart" and utilized a system that could automatically compensate as the restrictions occurred. They employed a gas flow phenomena called "choked flow." "Choked Flow" Provides Automatic Flow Compensation With No Feedback Circuits or Moving Parts! 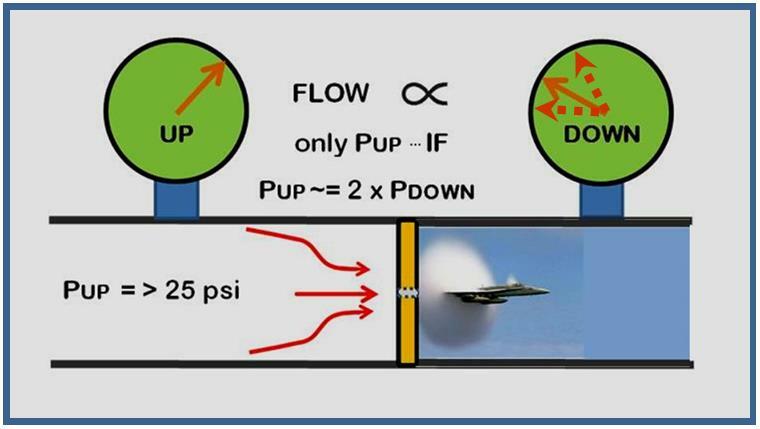 Choked Flow utilizes a simple principle, "gas cannot travel over the speed of sound!" Just like why you see "Lightening" before you hear the "Thunder." Sound pressure waves travel at 770 mph; light travels 1 million times faster! 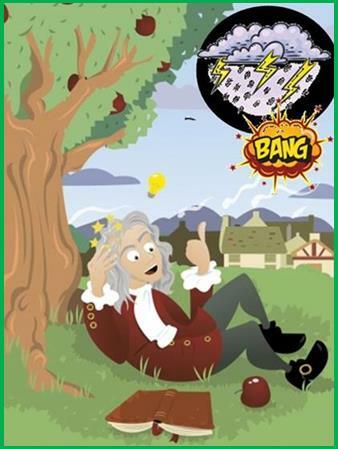 Sir Isaac Newton (the dude with the falling apple) measured the speed of sound fairly accurately in the 1700rds. He would understand how choked flow works - You Can Too! The approach used relies on the fact that the speed of the a gas through the small passage in a needle valve or orifice cannot exceed the speed of sound! When the speed of sound is reached, that speed in the small opening is what controls flow. Once that speed is reached flow is no longer influenced by the changing downstream pressure due to restriction variations. To achieve what is called "choked flow" that provides this Automatic Flow Compensation, the absolute pressure (gauge pressure + atmospheric pressure) upstream of the flow control device must be over 2.1 times the absolute downstream pressure. Using 2:1 for an approximate calculation and 15 psi for atmospheric pressure makes the math easy, see figure below for the pressure required. 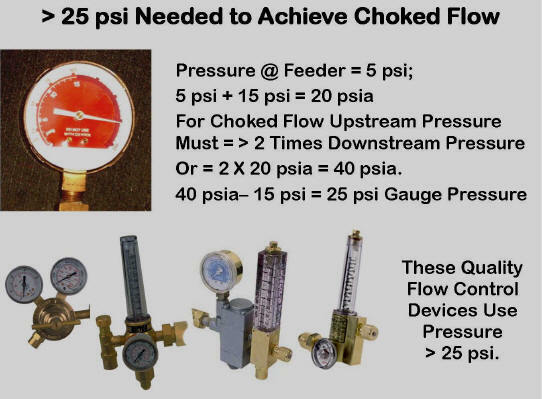 The figure below left presents the math and shows the pressure needed to achieve "choked flow" is over 25 psi. It is no coincidence that quality flow controls shown in this figure use pressures from 25 to 80 psi. The engineers that designed MIG and TIG flow control systems when these processes were introduced, knew of the varying flow restrictions and designed to automatically compensate so flows remained at the initial settings. If high pressure solves the consistent flow problem, is there a downside? 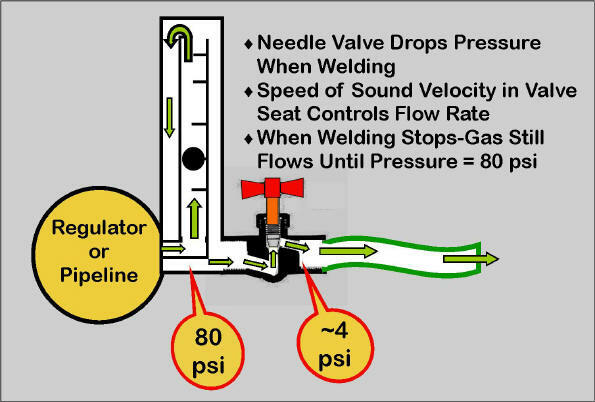 Yes, when welding stops and the solenoid closes in the welder or wire feeder, gas continues to flow though the needle valve or orifice and quickly fills the gas delivery hose with more gas as the pressure raises. It quickly reaches the pressure of the regulator for cylinder supply or the pipeline pressure. This stores a lot of excess gas volume equal to, in the example (80+15)/(4+15) = 5 times the physical hose volume of excess gas. We also find a typical 1/4 inch ID hose expands another 13% in volume at the high pressure. Therefore, the excess gas in the hose is 5 x 1.13 = 5.7 the physical hose volume! However using pressure less than 25 psi, as some have tried with devices like "Gas Guards," creates bigger, less obvious problems than what they are trying to solve! They eliminate Automatic Flow Compensation causing wide variations in flow. See test result comparisons of a proper flow control with a commercial low pressure device that showed wide flow variation. That device caused flows to range from 16 to 37 CFH when it was set for 31 CFH, Worse, the gauge labeled CFH read 31 while the flow varied! 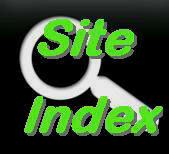 SIDE BAR: 1) Other factors, like setting excessively high flow or leaks, can also waste gas. However the gas blast at weld starts typically wastes 40 to 60% of the shielding gas even when flow is set properly and there are no leaks! 2) When welding, the pressure in the gas delivery hose varies automatically to flow the gas volume that is set by the needle valve or orifice to whatever is needed to overcome restrictions in the passages to the MIG gun nozzle exit. That is valid as long as the absolute hose pressure is less than half the absolute pressure before the needle valve or orifice! Our Patented Gas Saver System Controls The "Gas Blast" Caused By The Higher Pressure Needed For Choked Flow . Like "Chocked Flow" Our Patented GSS Does Not Need Any Moving Parts or Feedback Circuits to Achieve the Gas Savings and Improved Weld Starts! That excess gas, stored in the gas delivery hose when welding stops, "blasts out" of the MIG nozzle at each weld start! This high flow not only wastes gas but the high velocity (we have measured peak flows exceeding 200 CFH) creates a high degree of turbulence that causes air to be pulled into the shielding gas stream. The air causes problems with weld quality and produces excess spatter. This gas waste can be over half the total gas used. The solution to the gas waste and high peak gas surge is our patented Gas Saver System. It is a simple, custom extruded, small ID, heavy wall thickness gas delivery hose with a peak flow limiting orifice built into in the welder/feeder end brass hose barb fitting. It maintains system pressure and therefore Automatic Flow Compensation. Also very important, the controlled small amount of extra gas it retains, quickly purges air from the weld start zone and MIG gun nozzle. Purging air from the weld start area and gun nozzle is essential for quality weld starts. Some devices have been tried over the years that attempt to control flow at the wire feeder or welder to eliminate surge and have been rejected by welders! We used to agree with management believing welders just didn't care about "saving gas." Since forming WA Technology and working with a number of welders in production operations related to gas flow control we have found they were right! These devices such as Simple Orifices, Flowmeters or Regulators and Low Pressure Regulators that mount at the wire feeder do not provide the needed extra start gas to purge air! Stauffer in a 1982 patented device (Patent Figure Left) discussed the need for extra start gas and in his device adding a reservoir (#112 in Figure) to hold and deliver some extra start gas! When encountering flow control at the wire feeder, welders either drill out the orifice or if a flowmeter or regulator mounted at the wire feeder is being used they increase the steady state flow in attempt to compensate! They may not even know that they are trying to provide some extra purge gas but they see the inferior weld start result and attempt to compensate for the lack of purge gas! Increasing the steady state flow DOES NOT fully solve the lack of some extra start gas and it WASTES RATHER THAN SAVES GAS! IT DEFEATS WHAT THE MANAGEMENT WAS ATTEMPTING TO ACCOMPLISH IN THE FIRST PLACE! CLICK TO SEE WHY WE SELL DIRECTLY ON THE INTERNET AND NOT IN "STORES'"
1) Reduces the volume of excess initial gas flow at weld starts over 80%. 2) Quickly supplies a controlled amount of extra start gas purge at each weld start. 3) Controls the maximum gas velocity of the extra start purge gas using a peak flow control orifice preventing excess turbulence. 4) Maintains system pressure and "Automatic Flow Compensation." 5) Does the above with no moving parts or knobs to adjust- just continue to use your existing flow control device to set the steady state flow rate. The GSS provides improved weld starts with less spatter and elimination of sub surface porosity while saving money. There are well over 10,000 GSS's in fabrication shops saving millions of dollars of wasted shielding gas each year while improving weld start quality! Note: The GSS peak flow control orifice Does Not effect the steady state flow while welding - that is set by the existing conventional gas flow control device. For cylinder gas supply that can be a quality regulator/flowmeter or a regulator/flowgauge. On pipeline supply it can be a flowmeter or simple orifice located at the pipeline drop. It will prevent setting very high excessive flow rates if that is an issue. All Hospital Regulator/Flowmeters Operate at 50 psi! 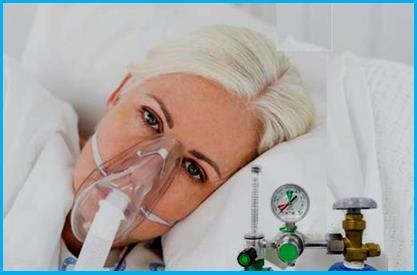 The flow rates used to supply oxygen to a hospital patient are similar to MIG flow rates, about 0.5 CFM or 30 CFH. To insure that possible restrictions, from kinks or bends DO NOT interfere with the Doctors prescribed flow settings they use a "Choked Flow" design, just like in MIG/TIG welding! Assuming they only need a low 3 psi pressure at the tight fitting mask, how much pressure drop can they have and still deliver the flow setting? Doing the math; 3 psi + 15 psi = 18 psia (absolute pressure.) Then twice that pressure is needed before the needle valve or 36 psia. To get back to gauge pressure subtract 15 psi and only 21 psi is needed. By using a 50 psi regulator there can be a 50 psi - 21 psi = 29 psi drop. Therefore even with pinched hose restrictions causing up to a 29 psi pressure drop, the prescribed preset flow will be maintained! 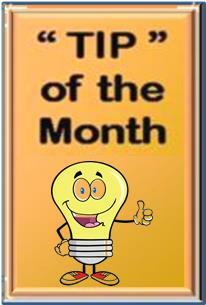 What do you think of the Tip Of the Month? "I have been in Metal Manufacturing for over 25 years. Recently I have been assigned to a department manufacturing centrifugal compressor impellers where a cover is TIG and MIG welded to the top of blades. Your Tip of the Month is the first plausible explanation (for occasional defects) I have come across that can explain this phenomenon and why it may be more prevalent in the springtime and in high humidity periods." Save over $1000 per year per welder and improve weld starts with Payback measured in weeks!! 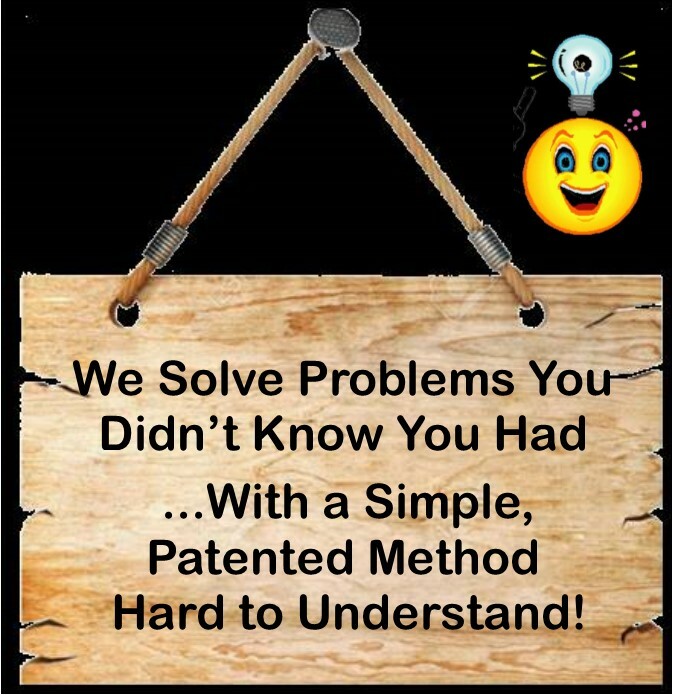 * US Patent # 6,610,957; "Welding Shielding Gas Saver Device" August 26, 2003; Canadian Patent # 2,455,644. Copyright 1999-2015 WA Technology TM; GSS TM; All rights reserved.